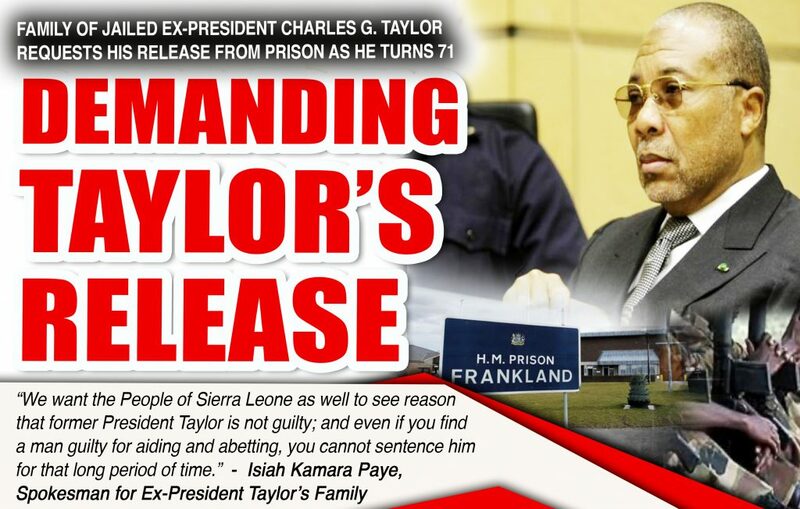 MONROVIA – Demanding his release from prison in the United Kingdom on his 71st birthday on January 28, the family of jailed ex-president Charles Taylor strongly believes that the former warlord committed no crime in neighboring Sierra Leone to warrant his 50-year sentence. The ex-Liberian president was indicted by the Special Court for Sierra Leone in 2006 on 11 counts of war crimes and crimes against humanity – all to which he pleaded not guilty during the trial at the international court. He was also indicted for planning in connection with the 1999 attack on Freetown. He cited the recent acquittal of Mr. Laurent Gbagbo of neighboring Ivory Coast was acquitted crimes against humanity after the international criminal court ruled he had no case to answer. In an interview with FrontPageAfrica, Paye said the former President poses no eminent threat to Liberia as he desires to reunite with his family. “Former President Taylor just wants his release, go on his farm in Gbarnga, live his life and do other things he wishes to do,” Paye said. Paye added that Taylor looks forward to building a library, children’s park and other investments in Liberia upon his release from prison. He insisted that the ex-president has no interest in Liberian politics and has no intention of inferring with or engaging in politics in Liberia. “Mr. Taylor extends his best wishes for Liberia and he has said he has no desire to ever interfere in the political affairs of Liberia and wants to see peace, reconciliation, growth and development in the country. He particularly prays for the children of Liberia to realize their full potential,” he said. Paye also distanced Vice President Jewel Howard-Taylor, ex-wife of Taylor, noting that they are not trying to take advantage of her political influence to seek his release. It can be recalled that during the 2017 election campaign, Madam Jewel Howard-Taylor while campaigning in Nimba County told her supporters that it was time to bring Taylor’s agenda back on the table. “Because of what happened in our government and the abrupt closure and arrest of former president Taylor we were not able to fulfill those promises. “The NPP is now strong, and so we want to call all of the NPP stalwarts across the length and breadth of Liberia to come on board and help us win these elections, we will put that agenda back on the table,” she said at the time. George Weah who was then the standard bearer of the Coalition for Democratic Change (CDC) debunked the Madam Taylor’s remarks, noting that the CDC had its own agenda. “CDC has its own agenda. The CDC agenda is not an NPP agenda. CDC’s agenda is not a Taylor agenda. Our vision for this country which we have clearly explained since the 2005 elections are about an inclusive form of government with everyone has equal access to opportunities and resources,” he said. Paye said Taylor’s family is going to engage the George Weah-led administration, ECOWAS, African Union to engage the international community to negotiate the release of the ex-president. According to the spokesman, Taylor is now deeply involved with matters of God and has been devoted and prayerful man as part of his daily devotion. “We’re going to write a letter to the President, the lower House, the upper House, and we are even going to write a letter to the Sierra Leonean government and to ECOWAS as well to see reason that former President Taylor should be set free because this is a man who was lied upon,” Paye said. The European Union Embassy in Monrovia informed FrontPage Africa that as part of terms on which Taylor was jailed, he is not supposed to meddle in Liberia’s politics and he is therefore being monitored to ensure adherence the terms and conditions of his sentence. “It is a condition of his sentence that he does not attempt to interfere in Liberian politics and this is monitored closely by prison authorities in the United Kingdom (where he is serving his sentence),” The EU Embassy in Monrovia wrote in a response to a FrontPage Africa’s inquiry. Who’s Behind US$200K Transfer from Liberia Football Association To Poland?